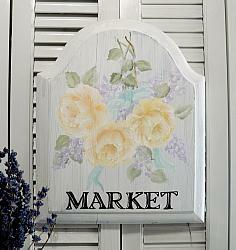 Hand painted shabby sweet Farmhouse chic Market sign. I painted this on wood, added beautiful roses in shades of pale pink, green foliage with teal wildflowers and the word "MARKET" on a white background with some distressing added for a warm worn look. How gorgeous would this be in your Farmhouse, shabby chic, or country style home. It is appx.11" x 13"
This is hand painted one of a kind signed and dated.